Once rundown and neglected, the ancient port city has been getting a makeover for several years now. How does this affect the mixed population of Jews and Arabs? 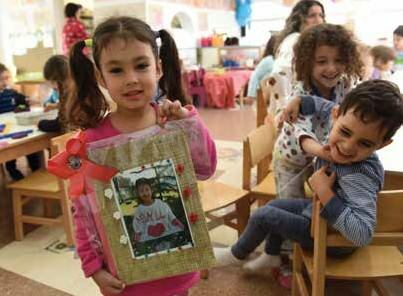 It was Purim and the smell of baking oznai haman (Haman’s ears) — as hamantaschen are called in Israel — was starting to waft through the kindergarten classroom of the Na’amat Shalom Day Care Center in Jaffa. Teacher Siham Satal, who is Muslim, sat in front of a big baking tray forming the triangular pastries with the children. It was also the day that Mother’s Day is celebrated throughout the Arab Middle East. Across the table from Satal, her Jewish counterpart, Revital Hason, showed off the special gifts all the children had prepared for their mothers. serving an equal number of Jewish and Arab children. Just like the staff at the center, the students are divided equally between Jews and Arabs, and Christians and Muslims — and over the clambering and enthusiasm of the children it is difficult to determine who is who. The holiday spirit and playful children are a welcomed oasis coming on the heels of a stabbing terrorist attack near the Jaffa Port in early March, killing a young American veteran on a study trip and injuring 10 people. The police identified the attacker as a 22-year-old Palestinian. He was not a resident of Jaffa. “The Shalom Day Care Center is an island of sanity in all this violence,” said Sivan Kedem, director of the center. “When the stabbing happened, I realized how important it is to be here and it strengthened my resolve. When you get here the world is different and you see it immediately.” These days, she added, parents who attended the center as children are sending their own kids here. Among the handful of traditionally mixed cities of Israel — including Akko, Lod, Ramleh and Haifa — it is not surprising that such a day care center took root under the direction of its first director, Yael Ben Shahar, in this coastal city of Jaffa, the gruff older sister to Israel’s sleek metropolitan hub of Tel Aviv. The gentrification of south Tel Aviv began creeping into Jaffa some 10 years ago, making its mark for good and for bad on this formerly gritty, working class city. Here the lives of its Jewish and Arab residents have always been intertwined, especially in the old Ajami neighborhood, working and living together as a matter of course. However, as old buildings in these neighborhoods are purchased by outsiders and new developments are built, this is less so. The big influx of Jews to Jaffa in the past 10 years includes mostly those who don’t want to integrate. The city’s population of about 46,000 is comprised of 30,000 Jews and 16,000 Arabs, both Christians and Muslims. Ibrahim Abu Shindi, founder and director of the Jaffa Arab-Jewish Community Center, noted that the reality of Jaffa is not black or white. “We are a part of the Palestinian people and it is a very difficult identity conflict for us,” Abu Shindi explained. “Lots of our families fled in 1948 and we have families in Jordan, Syria and Nablus on one hand. On the other, we have an internal conflict with our Arab, Palestinian, Muslim, Israeli identity. On one hand, we want to live in tranquility and unity, I believe in living together. I believe we can work together to deal with our problems as Jews and Arabs. That has been the goal of his community center for the past 23 years. Open from 7 a.m. to 11 p.m., Jewish and Arab residents create a long-term relationship there rather than just meeting for “hummus and gefilte fish,” he said. So while Jaffa is getting a much deserved face-lift, many of the longtime residents are feeling left out of their own city. One issue has been the controversial Andromeda Hill, a huge luxury housing complex that opened in 2000. Some call this gated community a “Jewish settlement.” Bordering the Ajami neighborhood, it has blocked off a sizeable stretch of property along the city’s main street from the rest of the city and blocked the view of the sea from many of its residents. From the time the community was being planned in the late 1980s, there have been protests from the Arab community who feel walled out and have their own housing needs. Women make “Jaffa Dolls” at the Arous El Bahar women’s center, a place to socialize and learn. The regeneration of the run-down ancient port city in recent years has brought an increase in tourism. According to Yael Sakori of Tel Aviv Global Tours, some 1 million tourists a year visit the bustling city, with 120 buses arriving each day. More than half of visitors to Israel make a stop in Jaffa during their stay, and it is second only to Jerusalem and the Western Wall in the number of visitors it receives each year, Sakori said. The municipality has picked up on the interest, reaching out to both tour groups and individual tourists. In late 2011, a new Old Jaffa Visitor’s Center opened to the public, featuring multimedia displays on the history of Jaffa as well as self-guided walking tours. Five free audio walking tours can be followed using smartphones by scanning barcodes in different locations around the city, which open up to a web page providing GPS navigation. Sakori’s observation that “the combination of old and new is a part of the city’s DNA” was adeptly demonstrated during renovations of an old building to create an upscale boutique hotel near the flea market. The remains of an 8th-century church were discovered in the process and will be preserved and displayed under transparent flooring combining the old and the new. Though, perhaps it would be more appropriate to say the melding of “ancient,” rather than “old,” and new, as some residents feel there is a lack of an attempt to reflect or preserve traditional Arabic architecture styles in new buildings. With its almost year-round temperate weather, the city’s refurbished flea market and seaside promenade have become destinations of choice for scores of local and international tourists who come for a stroll. Visitors walk the alleys of the market area with its new upscale shops, bistros and boutiques that have popped up among the renovated apartment buildings. Bars and restaurants and an immense art gallery dot the new boardwalk. A sprawling new park in front of the traditional Ajami neighborhood has been built over a dumpsite that had once been filled with building debris and garbage. The park provides a needed green space for the city residents and a great place for visitors to ride rental bikes. On the downside, many older businesses no longer find their place here. Property prices have gotten so high that local residents are being pushed out of their traditional stalls at the market where they hawked used furniture, Persian rugs, antiques and old trinkets. The younger generation is often forced to leave the city where their families have lived because they can’t afford to buy a home here. While the financial consequences of the gentrification affect Jewish and Arab residents equally, moving away from the center of family life is more emotionally fraught in the traditional Arab society, even if it is just a few kilometers away. Some longtime Jewish residents are also not happy with the way their city has been usurped for a different sort of clientele. Shopkeeper Uzi Hadad sat in the doorway of his store filled with odds and ends, one of the old-time holdouts of the flea market. It’s one of those shops that used to be a destination for a certain type of customer who likes to rummage around for little treasures. But, he affirmed, there is no place in Israel like Jaffa. “Jaffa is the complete opposite of the country. It is the only city in Israel that you can say there are good relations between Jews and Arabs,” he insists, though residents of the other mixed cities may disagree with his statement. On one of the streets where Persian rugs were traditionally sold, there remains one holdout, the store of Avi Cohen, 56. On a brisk spring afternoon, a minyan gathers on the sidewalk outside his shop to pray the traditional Minha service. Afterwards they share some soft drinks, then go back to their respective shops. “On the surface everything is pretty, but underneath they did damage to businesses,” Cohen said quietly, sitting down inside his store. “It is hard to get clients who want to come see rugs.” The local fishermen also are concerned about the development of the city and the port area, which, they say, is putting limits on their ability to fish. Their workstations are turning into “tourist attractions” with galleries and restaurants along the port. “Fishing is in my soul. I love it. It is like a sickness and unfortunately I have it,” said Johnny Sabah, 51, as he inspected his fishing nets for needed repairs after a day of fishing. He has been fishing for 42 years, he said. 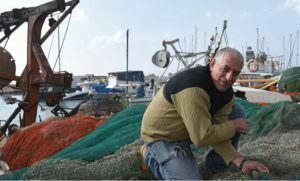 Johnny Sabah inspects his nets. 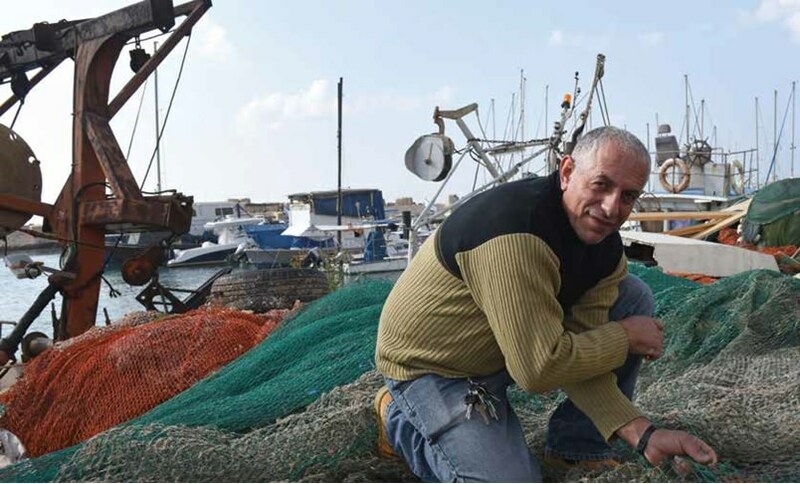 A fisherman for 42 years, he is unhappy that the development of the port is limiting his work. Ami Katz, head of the Jaffa “Mishlama,” the Tel Aviv Municipality department created to develop Jaffa and care for its residents, explained that restoring Jaffa is a strategic goal of the municipality decided on by Mayor Ron Huldai. They view the development as an all-inclusive “affirmative action” plan for the city in the areas of culture, education and affordable housing, which will move away from reducing Jaffa to only the hyphenated end of Tel Aviv-Jaffa, he noted. Since the founding of the Mishlama, the city has invested 1.5 billion NIS (about $388,000,000) in Jaffa in the form of infrastructure, streets, parks, playgrounds, schools and kindergartens. Special emphasis has been put into developing tourism and strengthening the arts and social infrastructures along the flea market, famous clock tower and port areas, Katz explained. But early on, the Mishlama also decided to implement a policy limiting the restaurants and cafés in the flea market to no more than 25 percent of the businesses there to maintain the authenticity of the market. “Jaffa indeed has turned into an attraction for tourists from Israel and abroad. The flea market is even more attractive and becoming more popular with every day that goes by,” Katz said. In addition, he continued, the municipality is careful to implement its policy of urban renewal while maintaining the daily life of the existing population. In that vein, they have also initiated housing projects for the Arab community. One of these is an affordable apartment complex on Michelangelo Street. “We have a commitment to make everyone feel at home here; we are serving everyone equally. We are trying to respect the past, plan for the future and live in the present,” Katz told visiting journalists during a recent press tour of the city. Still, for Raffa Sabah, 25, who works in a small but well-known hummus place on a dead end street on the outskirts of the now fashionable area of Jaffa, the going is still rough and getting tougher. Relations among the residents are good, he said, but the cost of living is driving out young people. The few new housing units that the city says are being built for locals do not nearly meet the need, he adds. Sabah is engaged to be married but can’t afford to buy an apartment to begin his new life with his bride, as is the expected tradition. “It’s difficult to buy a house here. It takes time until I have enough money for a down payment to apply for a mortgage,” he said. “I might just have to buy outside Jaffa.” Longtime resident Safa Younes, founder and director of the Arous El Bahar (Bride of the Sea in Arabic), a women’s center, loves Jaffa but at the same time sees the difficulties facing her city, especially Arab women from the lower socio-economic strata. These women, some of whom had been married off at a young age without much education, had no public meeting space until Arous El Bahar was founded, she said. Arous El Bahar attempts to provide a space where women can meet as well as learn. In addition to computer, business management, food workshops and community-building groups, the center has also formed a small crafts group for women to use their sewing skills. 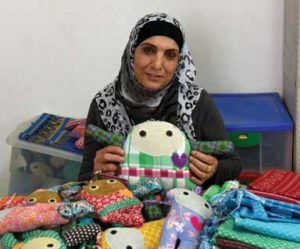 The women create “Jaffa Dolls,” some of which are sold at the Jaffa Tourist Welcome Center. To be truly profitable they will need to dedicate more time to marketing the dolls, acknowledged Younes. Designed by a Jewish artist and sewn by three Arab craftswomen, the colorful, soft dolls have names like “Yaffy” and “Duba” and represent the essence of cooperation among the residents of the city. Most important, it provides women like 56-year-old Sahar Nabulsi, who is married but has no children, a place to go instead of sitting home all day. From the roof of Arous El Bahar, the women can see the new buildings that have been taking over their neighborhood. When Younes opened the center some nine years ago, the women could look out to the horizon and see the ocean, she said. But now all they see is the development of opulent houses, blocking the sea from their view. “These are people who we do not see,” said Younes. “They come into their parking lot, park their cars and go inside their homes. They are not people who come to us to be together. They are different from the local people. Most of the people who live there are rich Jews. Many don’t even live there. They just buy it as a real estate investment. Despite the many coexistence initiatives, the balance remains delicate at times. When the wave of Israeli-Palestinian tensions erupted last October, demonstrations by both Jews and by Arabs in Jaffa and elsewhere turned violent. In Jaffa, local Arab residents feel that they had not been permitted to express their opposition to the situation surrounding the Al Aqsa mosque, whose status quo was thought to be in danger of being changed. The large demonstration in Jaffa was apparently organized by the northern branch of the Islamic Movement in Israel and made the news headlines with its unexpected violence. A journalist and writer in Jerusalem, Judith Sudilovsky has covered the Middle East for 20 years and is a regular contributor to The Jerusalem Report. She wrote “Boys and Their Toys” in our summer 2015 issue. This story is from the Fall 2016 issue of NA’AMAT WOMAN. You can read the full issue here.